It’s human nature to take things for granted. We all do it. But, when someone we know experiences a fire, severe accident, or health emergency, our perspective changes. We become a little more cautious, and a little more aware of how quickly our lives can change. The Kingsville Volunteer Fire Company has been serving area families since 1954. We now have over 100 members who provide fire suppression, emergency medical services, and comprehensive rescue services, including swift water and flood. Last year we responded to over 2000 emergency calls. We live in your neighborhood. Our families are part of your community. Our station is 100% operated by our volunteer members. Countless hours are spent at the station, after we’ve put in a full day’s work elsewhere, or on weekends when we could be spending time with our families. We do what we do, because we have a fierce dedication to protecting the community. In order to continue protecting you and your family, we must rely on community and business donations. *The station that we call our home-away-from-home was built in 1958. *Almost 60 years later, the interior of our station is tattered and torn. *The building doesn’t meet modern safety codes. *Conducting vital large group training sessions has become a struggle. *Our men and women volunteers must sleep in the same room because there isn’t enough space. while they are in the building. injuries while exiting the bays with he emergency vehicles. The Legacy Brick proceeds will help us move forward in building a modern and safe fire station. 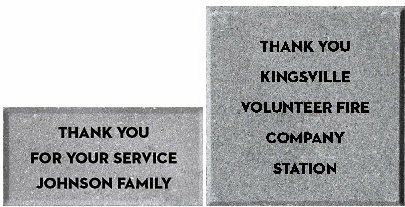 Each brick will become a permanent part of our new Kingsville Community Legacy Patio and will be etched with your special message. It’s a great opportunity to leave a legacy of your family name, honor a loved one, celebrate a graduation, wedding, birth, or other special situation. We also welcome the participation of businesses. Your Legacy Brick purchase will help make a permanent contribution to the safety of your family and your Kingsville neighbors. Brick purchases and monetary donations are tax deductible. If you have any questions, please give us a call at 443-622-7713 or email info@GIVETOKVFC.com. Place your order below. Feel free to order more than one brick, however, you will need to submit a separate order for each message. Thank you for your support!